I have a nice brooder by "Pet"iatric Supplies but really most brooders out there are a waste of time for anything but Week 1 chicks who need more constant high temperatures. Most manufactured ones aren't very portable either and those that are cost much more. The best brooder I've found is a simple plastic container on a heating pad. It's cheap and easy to transport. The heating pad should be set on "low." Medium can sometimes be alright if the bottom of the container it sufficiently padded. 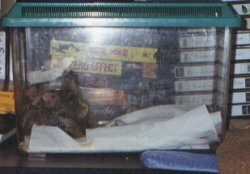 Chicks can be kept directly in the container or further divided into magerine tubs or baskets. If chicks are kept directly in the container then the pad should only be under 1/3 to 1/2 of it. This allows the chicks some movement from warm and cooler areas, though most don't figure this out. Which is best: syringe, spoon or tube/gavage? The syringe is my own tool of choice. It allows quick feeding and minimal mess. The spoon is much slower and messier. I don't care for it because it may involve dipping back into the formula (contamination risk) and because it allows the formula to cool, but mainly because it's tedious. Many people like the spoon because they think it gives them more of a chance to bond with their chicks. However bonding can be achieved more freely outside the feeding time. Tube or gavage feeding is frowned upon by many aviculurists. This is because it is often used by large breeding operations to quickly feed chicks in an assembly line fashion. The problem is not with the method itself (though this instrument can be deadly in the hands of an amateur) but with the people who tend to use it. Often they won't properly socialize their chicks at all. Nevertheless ever breeder should own at least one tube. It is invaluable for feeding stubborn or ill chicks who may have no feeding response, or those who are just to tiny to use the other methods on. You'll have to use your good judgement on this one. You want to fill the crop but not stretch it out so much that it won't drain properly. I suggest looking at parent-raised chicks for reference. My cockatiels are certainly more daring to swell chicks' crops than I am. By the way, some chicks continue to beg even if they're ready to burst so begging cannot be used as a reference. For the first few days chicks will take formula every 1 1/2 to 2 hours around the clock. Over the next week you can probably up this to every three hours, still around the clock. By the time the pinfeathers start coming in they should be up to every four hours, with only one night feeding (or none at all if you stay up really late and wake up really early). If I'm home I let the chicks decide- when they cry I feed them. Some breeders believe that in order to be tame chicks need to be hatched from Day 1 so that the first thing they see is people. This is utter nonsense. I've raised dozens of chicks and believe me that tameness is directly related to how much time you spend with the chicks and what you do. Others hatch chicks from Day 1 just because this increases production by getting the parents to raise a second clutch. I like to pull mine when they have pinfeathers but well before the feathers start opeing. I go by Parrots: Handfeeding and Nursery Management with all my measurements. I begin sucking formula into syringes at 110 degrees. It cools quickly. There are many on the market each killing it's own type of pathogens. I use bleach. It's like duct tape- works for everything. Add one teaspoon of bleach per gallon of water. The only problem with bleach is that it tends to make the syringes harder to push and pull. I use Kaytee Exact formula. Commercial formulas are designed to have all the nutrition a bird needs and you're not supposed to add anything to them (it will upset the balance). Still, I add Spirulina because I hear it's good for the immune system and sometimes peanut butter during weaning (the babies eat less so I want to make what they do eat more fatty). Weaning is probably the most stressful part of a bird's life and the most agonizing for the feeder. Weaning starts when your babies start refusing food. They'll beg to be fed just as usual and then as soon as you point the syringe at their mouth they'll clamp their beak shut. Even before the bird begins refusing formula you should be adding solid foods to the cage. Try softer things, or things that are easy to pick up. I start with bananas, cherrios and parsely. Check the chick's crop a couple times a day (just move those feathers aside) to see if it's eaten anything. I can't say when to stop formula completely- whenever the bird is eating completely fine on it's own. You may still want to offer formula on occation just in case. Aim your syringe from the left side of the birds mouth to the right. The trachea (windpipe) is on the left. You want the syringe to point over it towards the esophogus on the right. Mixing formula and then heating it in the microwave can develop "hot spots" that can burn your chicks. Instead heat the water first and add this to the dry formula. Wipe your babies off! Formula turns to cement when it dries. I've seen many a chick develop nasty a formula chunk moustache. Tissue paper works good for this. Be gentle. Formula cools quickly as you feed. Make some system to keep it warm. I heat up the water in one cup and mix the formula in another. Then I fill the syringes and drop the ones I'm not using into the hot water cup. This keeps them nice and warm.